This error "android insufficient storage available" will then start displaying on the mobile screen with plenty of space. A device even with a 16GB storage capacity will have too short memory left after the OS is installed or any pre-installed apps are loaded or because of any cache get stored by various apps etc. These are a couple of minor reasons behind insufficient storage error message. It's quite annoying at times when you need it the most because you can't install app and it keeps popping up on the screen over and over again. No worries, in this article I'm going to explain the quick solutions for the most possible reasons that cause the error. In the previous page, you were reading; 25 Reasons, Why Android phones are the best phones compared with the iPhones? and today I'm going to describe how to fix common android errors quickly. Why it shows 'Insufficient storage: This device doesn't have enough space'? Cache are stored on your mobile device. Since Android is a Smartphone Operating System, it stores the data as a cache just to speed up the process of re-downloading the data from Google Servers as well as to reduce the load. Software flaw- this is a rare possibility when the operating system fails to access system files and storage gets crashed. There could be a conflict/issue with a current Android version available in your smartphone. I've listed couple of steps below which will help you fix this error Insufficient Storage Available on Android quickly. 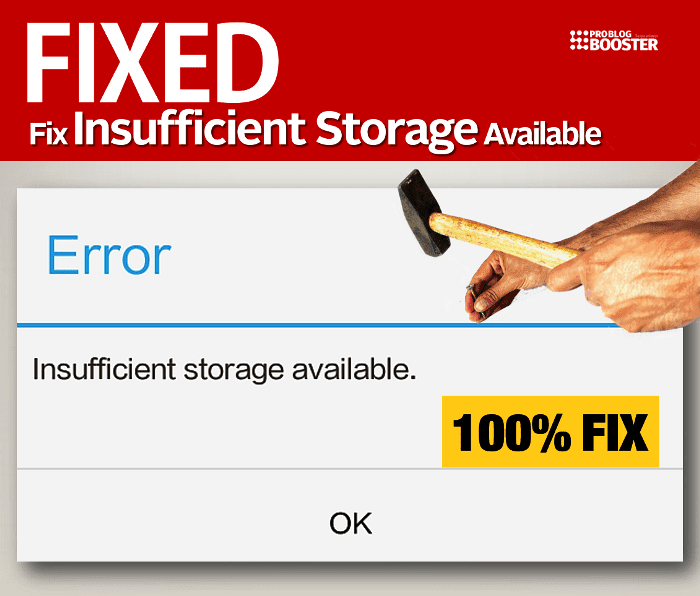 Fix "Insufficient Storage Available" Android error. Navigate to App / Application manager. List of all the applications will be displayed. Now click on menu option (3 dots) displayed on top-right side. Tap on Sort by size option. Select apps which uses most storage. Tap on Clear Data button. Also tap on Clear Cache button. Just Restart your smartphone, that’s all. Try to Clear cache data. Please note, clearing from Setting >> Storage screen is totally depends on the version of Android you are running, as well as the type of the device. In this case, you may search for 'storage' under Settings screen to go to the page where you can clear cache data in one shot. Here you may try installing 3rd party apps like App Cache Cleaner, CC Cleaner, CM Lite, Clean master etc. Sometimes, these apps help you to keep your smartphone clean on a regular interval. Tap on Move to SD Card button. Allow the phone to move the app from Device to SD Card. Once done, just Restart your smartphone. I’m sure by following any one of the methods from listed ones will help you resolve the error. If you are facing this error or something you want to suggest apart from above points, feel free to use below comment section to get in touch with me anytime. Happy to hear from you and to implement the suggestions for helping others.